In light of Notre Dame’s linebacker Manti Te’o that got duped & the Lance Armstrong thingy, I have something I would like to come clean about, myself. This has to do with my youngest daughter. It’s something I have been trying to avoid, sweep under the rug, just kind ignore it & hope it goes away. However, I really don’t think it is. So, I thought now would be a good time to just come out & let everybody know. She likes math. There, I said it. I am feeling some sense of relief, but maybe should tell you that I really think she LOVES math. Which now, all of this is just leavin’ a bitter taste in my mouth. I know ya’ll are thinking, what is the big ol’ deal with that? Really? Well, let me just explain a few things to you. I do not like math. I actually refuse, as an adult, to do simple addition & subtraction in my head. Mostly subtraction, but it’s just because it doesn’t make sense to me or come easy. You see, I was tramatized by math at an early age. Back in 3rd grade we had this awful thing we had to learn, called times tables. Does anyone here know what multiplication did to me?? The good intentioned teacher would pass out these tests, with a bunch of multiplication problems on them. Then, we were timed. (Much the same way, Miss Neenee is this year, in which she has LOVED.) Only, I would work a few problems, then just start bawlin’ my eyes out. I did not have these things memorized. They did not make a bit of sense to me. Why did my math world have to change? I was perfectly content with addition. Now, this junk? My teacher would ask me if I needed to go to the bathroom. And of course I did. It pretty much went that way every day, until times tables were over. So, when Miss Neenee came home all excited about the multiplication speed tests, I was like, “Whoa, there, missy, you just hold on. Multiplication is hard, I mean crying everyday hard. You just don’t worry about this. We will take care of it. 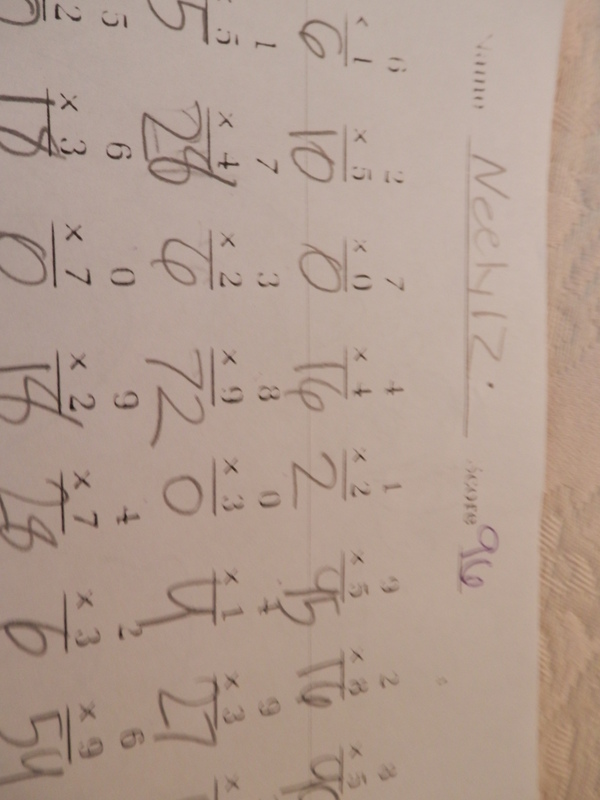 Mama will study with you & you will learn these ol’ dumb math facts….” In which she interupts me in mid- “blessing her heart it’s going to be alright talk”, to say, “It’s not hard.” Then proceeds to whip out a timed multiplication sheet, that she had made a 100 on. I just stood there speechless. My precious little girl, in which we have all things common, is going to like math. I did what any good mama would do. I cried a little to myself, just thinking, this is not going to last. She’s just like me. I hate math, she will hate math…. just give it some time. It will tear her apart, as it did me. Then, I would make sure no one knew about it, because heck, I did not want to embarrass my child, by everyone knowing she was no good at math. Why, she’s my baby. I think she’s great at everything. This will all pass & I will be there for her- dialing up a math tutor, just in time, to get her on the right path. She will be like me, loving to write, tell stories, you know things you love English for. Only, that’s not happening. And I did not want to admit it to myself. But I think it’s time. I think about her family & don’t know why this has not dawned on me. My Daddy – for double digit years was a cost accountant (who must love math). My Mama worked in finance (evidently dealing with math, a lot). My father in law & mother in law, her grandparents, owned businesses all their lives(somebody was doing math). My mother in law was especially smart when it came to numbers(thus another reason she was awesome). My older girls, both understand & enjoy math(is this genetic?). Just this week, looking through her weekly sent home papers, I don’t think this is going away anytime soon. 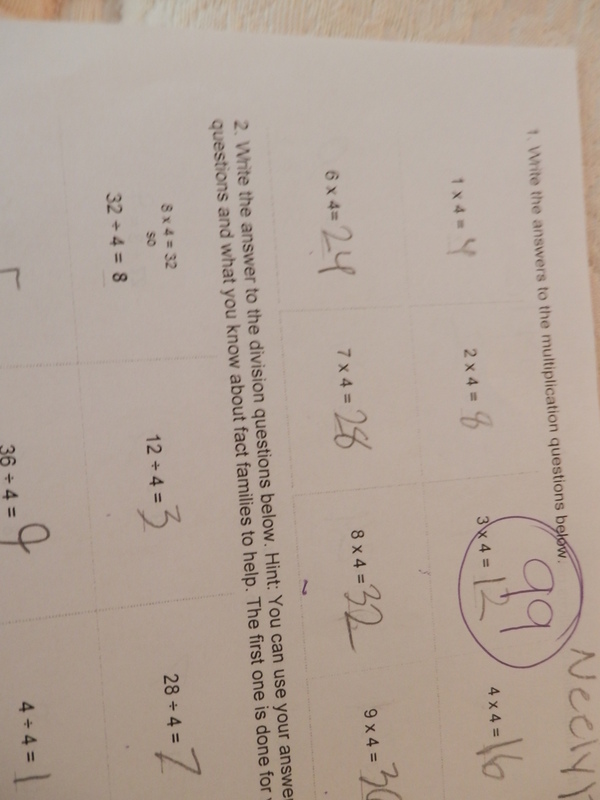 (She had a 96 & 99 in there, on Math). Why I did not see this coming, I don’t know. But here it is & there’s nothing I can do about it. I am just sorry you had to hear it this way. If you see me out at the store, or church, please don’t mention this to me. Because I am still having a bit of pain, upsetness, trying to digest & understand what’s going on here, with it. So, with all of that, I guess I need to say thank you to her teacher, this year for making Math so fun. (Where were you when I was in 3rd grade???) Thank you to my family for passing this (mutant) math gene along to my daughter (in which I missed out on). Hopefully, her world will make far more sense to her, since she is not mathmatically challenged as her mother. And, too, I forgive you, Miss Neenee, for loving the math that I hate. It’s alright. I will get through this. Oh, and one more thing, those Math Awards, that she’s been getting for the past few years, well, I guess I owe them an apology, too. I am sorry for not acknowledging you all sooner. It takes a lot for me to admit me & my sweet Miss Neenee might have one teeny weeny thing not in common. Which is ok. Maybe. I don’t know. I will get back with you on that one. Furthermore, I guess my life could be worse. She could like bananas. I hate bananas. They feel so squishy & nasty in my mouth. Oh wait. She does like bananas…..You know what, I am going to be going now because I should be washing clothes.